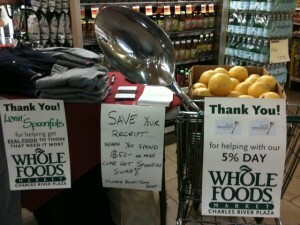 On April 7, Whole Foods at Charles River Plaza hosted Lovin’ Spoonfuls for 5% Day. 5% of the day’s sales were donated to ‘Spoonfuls. We had a great time hanging out with our volunteers and talking with shoppers who stopped by. Thanks to Whole Foods for their support!